The The Winston Churchill’s Britain at War Experience Museum has hundreds of pictures of Winston Churchill, but one in particular is getting a lot of attention. It’s one of the most iconic picture of Churchill ever taken, cigar clamped between his teeth, flashing the V for Victory signal at a 1948 military base opening. Unfortunately for the museum, someone has edited out Churchill’s cigar for reasons unknown. Is it an anti-smoking statement? John Welsh, curator of the museum, believes it is not. “We’ve got all sorts of images in the museum, some with cigars and some without. We’ve even got wartime adverts for cigarettes in the lift down to the air-raid shelter, so we wouldn’t have asked for there to be no cigar,” he claims. 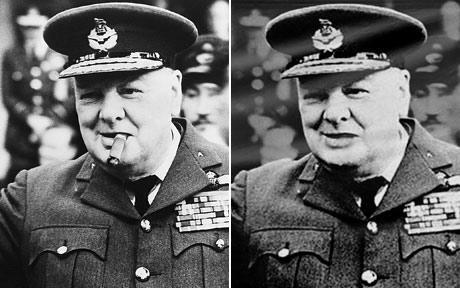 The question remains unsolved: who stole Churchill’s cigar and gave him a snarl?